Here you can find all of the resources we have used in class. 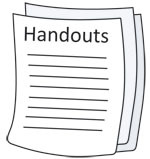 For each day you will see a PDF of the slides, Lesson Handout, and Lesson Handout Answer Key. Today we just finished up the handout from yesterday. Please see below. Today we took limits to a whole new level. We explored what happened to the slope of a secant line as the two points came closer and closer together. This led us to formulate a way to find the slope at one point by applying limits. Today we spent the first half of the class reviewing for the quiz, and the second block we took the first quiz! !